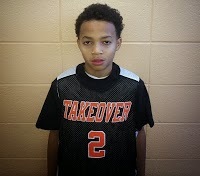 The 7th Grade Division of the DMV Takeover had some great moments and gave us a first time champion. Here’s Part 1 of our Top Performers in this class. Williams seems to always control the paint against any team he plays. He isn’t the most athletic player on the floor but standing 6’3” he understands how to finish through contact or against longer more athletic players. He has added a nice short corner and high post elbow jumper to his game and he consistently gets to the line and converts his free throws. Big Smoove is a walking double – double. He had 10 points and 10 boards in the championship against Team Nelson and had gaudy numbers against BMore’s Finest in the semi with 17 points and 19 rebounds. Terrance has made a case that he is the top Power Forward in the region and one of the best in the country. Brelsford is the “Maestro” of the Takeover team. Takeover has added more weapons around him so he has needed to score less this year but he understands when he needs to score versus being a facilitator. When Williams was absent in a pool play game he scored a team high 12 points. Tyler is one of the best passers in the class as he always plays with his head up and is trying to get you the ball in scoring position. He loves to throw the lead pass down the court so if you don’t get back on defense Takeover will be getting layups. He has become a more vocal leader as he is always directing traffic both on the offensive and defensive end. Tyler is a high IQ player that understands how to finish out games and he is a great free throw shooter. Heath is a long athletic wing with a high motor on both ends of the floor. He is deadly in transition and gets to the free throw at a high rate. In the half court he loves to slash to the basket and knows how to cut without the ball. He also has a nice mid-range jump shot and can shoot the floater. Heath can occasionally knock down the long ball and as he becomes more consistent from range he will be pretty much unstoppable. On defense he can guard either guards or forwards and he rebounds at a high rate for his position using his long wing span to his advantage deflecting balls and making getting steals in the passing lanes. Young is Brelsford’s back court mate and they complement each other nicely. Jahmir does whatever the team needs him to do to get the win. He brings his fast attacking style on the offensive end as he loves to get to the basket and either finish with his floater or get all the way to the rim. He also has a nice mid-range pull up and can knock down the trey ball. On the defensive end he exudes energy and has the ability to guard taller guards and lock them up. He is considered a thief on defense as evident by all the steals he gets. Long is a new addition to the Takeover team and he had a good weekend. Mekhi plays to his strengths which is his catch and shoot jump shot from mid-range out to the three point line. 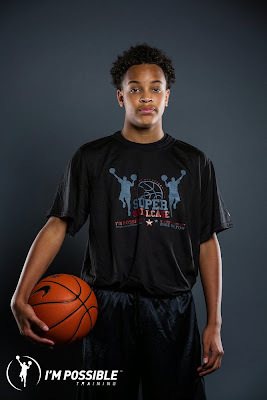 He makes his free throws and runs the floor hard so he can get easy transition layups. Long also rebounds very well for his position. Bradshaw looked to be in mid-season form during the championship. The game started out slow then the southpaw just ignited the show with 10 straight points. He had the floater dropping and was too much to handle in transition. This kid is definitely wired to score and single handily kept Team Nelson in the game. He also seems to have shot up a couple of inches since last season which makes him more of an intriguing prospect. Ingraham once again proved to be an inside force all weekend. Though productive he’s still a work in progress in terms of footwork, touch and overall post moves. The gentle giant backed defenders and got deep post position. Opponents need to take their shots now while he’s still developing because in a few years he’s going to be difficult to contain. The quarterback return from a broken ankle and guided his troops to the finals. The team just flows better when he at the controls. He sets the pace and makes sure the ball gets to the right person at the correct time. Once he gets in basketball shape he’s going to help this team return back to their dominate form of last year. Some might look at Scott and see a player that gets out of control when driving at times but I see a young colt that when he gets it all together should be a blossoming prospect. I love his aggressiveness and willingness to play through mistakes. Defensively he does the job inside in terms of blocking shots and rebounding on the other end he’s slowly making that transition to the wing. Mungo is a tough hardnosed player that always plays at his pace. He is most effective when he receives the ball on the wing and attacks the basket finishing in a variety of ways often through contact drawing and one opportunities the old fashion way. If need be you can put the ball in Mungo’s hands for straight isolation plays as he can handle the ball really well and he makes good decisions with the ball in his hands. He can guard multiple positions and rebounds well for his position. Mungo has a great demeanor with a calming effect and his team seems to look to him when there is a pressure situation in the game. Che is a long athletic forward that projects to be wing player. 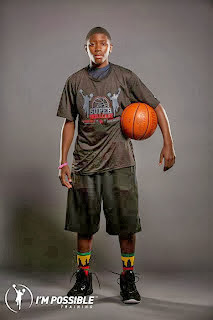 He possibly could have been one of the top 7th grade prospects in the gym this past weekend. Evans loves attacking the basket and finishing high at the rim and he has an improving jump shot as he knocked down a few long balls against Takeover in the semi. On the defensive end he has great timing and understands how to contest and block shots without fouling. He also can rebound at a high level if needed while being able to guard multiple positions due to his elite length and athleticism.